Joy Creek Photo Archive (c) all rights reserved Diervilla sessilifolia 'Butterfly' (Pieter Zwijnenburg) is also known as Bush honeysuckle. Terminal clusters of pale yellow flowers in late spring. This has repeated bloom for us in October. 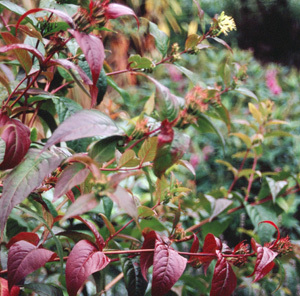 The glossy, lance-shaped foliage whorls up the reddened stems putting on a modest display of color in the fall. May to June. 3-5 ft. x 3-5 ft.